“Can Federalism – The Genius of the Constitution – Restore Public Confidence in Congress and U.S. Government Institutions?” Sen. Ayotte, the 2018 Perkins Bass Distinguished Fellow. Congress continues to have abysmal public approval ratings. Does the expectation of many in the public, coupled with the promises of politicians running for federal office, that the federal government can solve almost every problem lead to a disconnect with the American people when Congress gridlocks and/or doesn’t solve problems? The Founders established a federal system delegating certain powers to the federal government but leaving the remainder to the states. By the federal government continuing to expand in areas that would be better governed and managed by the states, the American people become more dissatisfied with the Congress as a whole. 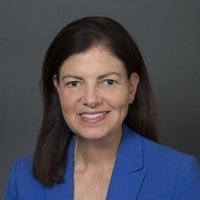 Kelly Ayotte represented New Hampshire in the United States Senate from 2011-2016, where she chaired the Armed Services Subcommittee on Readiness and the Commerce Subcommittee on Aviation Operations. She also served on the Budget, Homeland Security and Governmental Affairs, Small Business and Entrepreneurship, and Aging Committees. Senator Ayotte served as the “Sherpa” for Justice Neil Gorsuch, leading the effort to secure his confirmation to the United States Supreme Court. From 2004-2009, Senator Ayotte served as New Hampshire’s first female Attorney General, having been appointed to that position by Republican Governor Craig Benson and reappointed twice by Democratic Governor John Lynch. Prior to that, she served as the Deputy Attorney General, Chief of the Homicide Prosecution Unit and as Legal Counsel to Governor Craig Benson. She began her career as a law clerk to the New Hampshire Supreme Court and as an associate at the McLane Middleton law firm. Senator Ayotte serves on the boards of Caterpillar, News Corp and BAE Systems and the advisory boards of Microsoft, Blink Health, Chubb Insurance, Revision Military and Cirtronics. She is a Senior Advisor for Citizens for Responsible Energy Solutions. She also serves on the non-profit boards of the One Campaign, the International Republican Institute, the McCain Institute and NH Veteran’s Count. Senator Ayotte graduated with honors in 1990 from the Pennsylvania State University and earned a Juris Doctor degree in 1993 from the Villanova University School of Law. She is a native of New Hampshire and lives in Nashua with her husband, Joe, a retired Air Force combat pilot, and her two children Katherine and Jacob.